Watch this space for detail about new engagements coming soon! Y-Exchange is a monthly series of presentations about performing arts, technology and science and how they intersect and inform each other, in which selected artists and scientists are invited to talk about their life and work. Y-Exchange is co-presented by Kinetech Arts, ODC Theatre and The Djerassi Resident Artists Program. This month, Y-Exchange is proud to present award-winning Cellist Joshua McClain and our very own Dr. Alison Marklein, who will talk about her role as a science advisor for The ClimateMusic Project, and the potential for communicating scientific insight through the arts. This event is open to the public and admission is free. For more information, please click here. Can solar energy help to solve the climate crisis and contribute to sustainable economic prosperity? Learn more during Solar Education Week, a nationwide initiative sponsored by our partner Re-Volv. We will have videos of our work available for screenings at local events across the country, and have recently completed an accompanying discussion guide to facilitate conversation around solutions to climate change. To attend an event or to organize your own, please click here. Our on-going collaboration with the San Francisco Conservatory of Music’s Technology and Applied Composition Program will culminate again this year in a public concert of student works at the Exploratorium in San Francisco. We are excited to see what the creativity of this year’s student cohort will produce! Watch this listing for additional details to come soon. Come say hello at Acterra’s 2019 Business Environmental Awards Ceremony and Reception, where we will be screening a video excerpt from Climate and engaging in a conversation about climate science and solutions. For more information and to register, click on the logo below. In support of the Global Climate Action Summit, we produced a light-hearted climate action event in which, in just over six hours, we staged 21 superlative artists, all of whom performed an answer to the question What do you want the future to sound like? via music or spoken word. This was not our regular fare of science-guided music, but purely non-scientific expression sessions that engaged both the arts community and the general public! We performed Climate to a standing ovation at UR18, a global conference that included 1000+ representatives of government, industry, and NGOs from 100 countries. The event was held at the 18th Century Palacio de Mineria in Mexico City's historic center. We were honored to have James Balog join the post-concert panel discussion with Dr. Bill Collins, composer Erik Ian Walker, and Stephan Crawford. April 25th, 2018. Live with Bill Nye at SFJAZZ in San Francisco. We were honored to have been invited to perform at this sold-out KQED-sponsored event at the prestigious San Francisco Jazz Center. April 15th, 2018 Student recitals, San Francisco Conservatory of Music (SFCM), San Francisco. A year of collaboration and a semester of experimentation and learning culminated in a night of data-driven music, designed to bring emotion to the numbers and encourage action through sound. 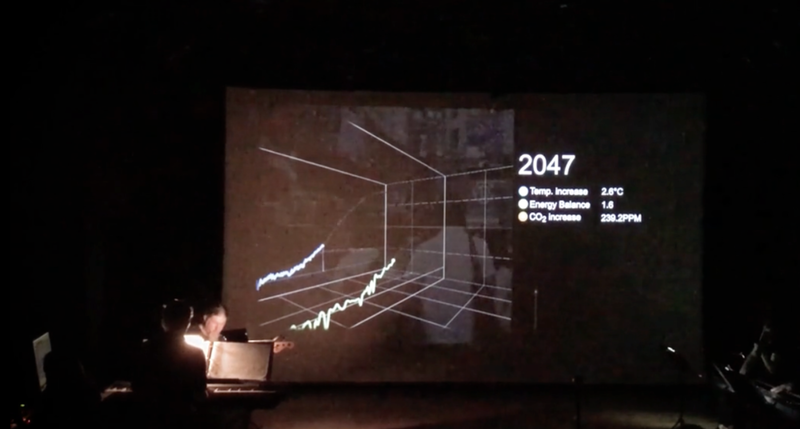 Students in the Theory of Musical Synthesis course have collaborated with “The Climate Music Project” to produce a concert of music inspired and driven by data related to global climate change. December 9, 2017. Private showcase at the Taube Atrium Theater in San Francisco. This was a "show and tell" event for community leaders. It included the breadth of our current work and collaborations, including the premiere of a new dance piece by Kinetech Arts, and a demonstration of a VR experience embedding our content that is under development by our friends at FXPAL. This was our first collaborative show with our friends at Kinetech Arts, which premiered a short dance piece called "Vertigo", with science -guided music by composer Erik Ian Walker. Our first campus event for a student audience! 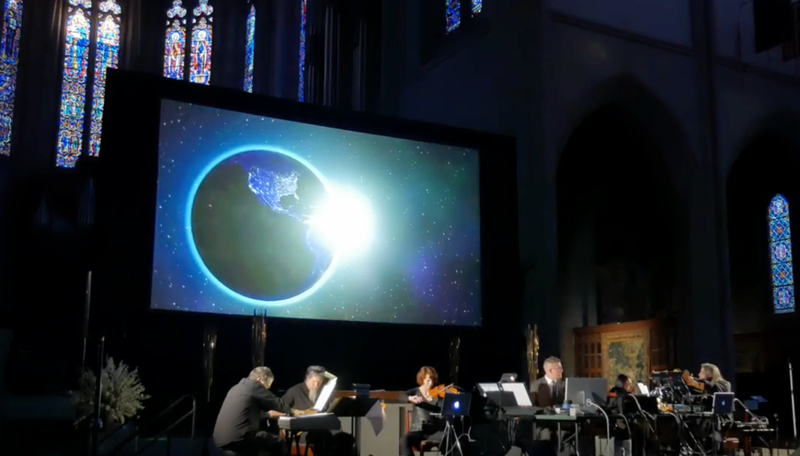 "I was profoundly moved and impressed by the science-driven approach to communicating such a nuanced and complex topic such as climate change through musical performance. I left the performance with a feeling that, personally, the CMP was the best artistic outreach project for scientific communication that I have encountered to date." "I was hugely touched by your performance and had to hold back tears at the intensity and sense of urgency the music brought.."
"I've never been more moved by such a jarring cacophony of music"
"It's the most powerful, visceral representation I have heard or seen: Because through the rhythm-tempo-dynamics-pitch we embody the music, instead of just looking at and away from the data"
"It really translates into visceral terms a threat that can often seem impenetrable and abstract..."
"What an amazing way to educate!" "Really an impressive presentation...it was very stirring and it evoked strong emotions, which only good music can do....an amazing production really!" "...I never felt as moved or motivated until I was able to sit through this experience. Thank you!" "Holy Moses!...the music was so effective and beautiful..."
Photograph provided by Melinda Fowler.